The MINOAS project (Marine Inspection Robotic Assistant System) is an European project under development. 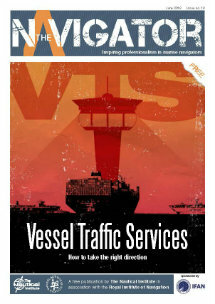 The project’s aim is the re-engineering of the methods that are being followed during a vessel inspection. The project introduces the concept of having locomotive robots inspecting a vessel (e.g. a cargo hold) which are under the direct command of a human inspector. Using virtual reality the inspector is able to concept that integrates human personnel with high locomotion-enabled robots, effectively “tele-porting” the human inspector from the vessel’s hold to a control room with virtual reality properties. A brief description of the design and development of a Magnetic Autonomous Robotic Crawler (MARC) with track-based locomotion and electrical propulsion is given below. MARC is able to operate on vertical walls, going beyond discontinuities between consecutive surfaces, and carrying a significant payload. The vehicle is required to be able to maneuver over planar surfaces and follow the vertical shell frame profiles, whose range and orientation have to be perceived by suitable sensors. The vehicle sensor package, integrated with external localization systems of the type presented in projects deliverables, has to provide measurements of the vehicle position and attitude. The vehicle mechanical design is essentially determined by the choice of the climbing system. In order to minimize the risk of detaching and crashing, while using a passive adherence system, magnetic tracks are preferred to wheels in virtue of their capability of maximizing the contact area with the metal surface. In order to allow the platform to maneuver between the vertical shell frames, carrying on a small electro-mechanical arm, as discussed in section 2, the resulting length and width of the vehicle are about 49 cm and 43 cm respectively, with a height of about 18 cm excluding the boxes for data acquisition and control electronics and payload devices. 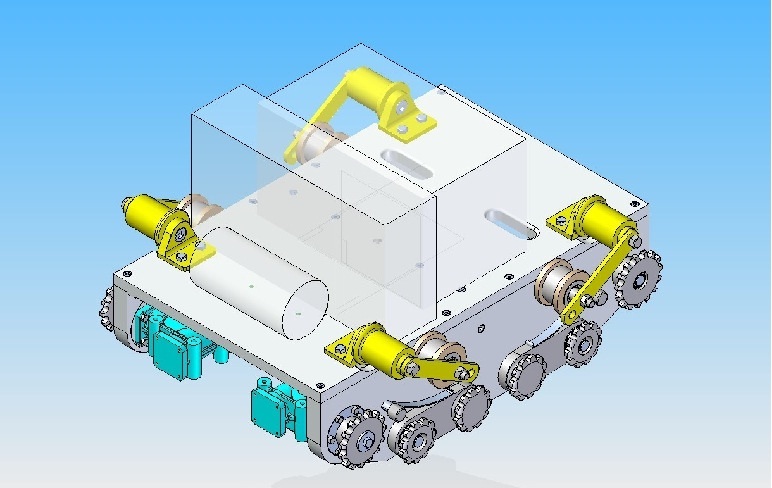 A 3-D rendering of the Magnetic Autonomous Robotic Crawler (MARC) is depicted in Fig.2, where dummy parallelepipeds and cylinders represent the cases for control and payload electronics and payload devices respectively. In the bottom part of the vehicle, motors and gear-boxes are displaced on the two sides, leaving free space for batteries along the longitudinal axis and in the rear part of the platform. A couple of transverse openings allow the passage of cables from the batteries to the boxes of electronics. The MARC actuation system is basically constituted by a couple of magnetic tracks, actuated by an electrical motor coupled to a gear-head through a suitable mechanical interface. The magnets are lodged in dedicated housing connected to a chain to constitute a track. On the basis of an expected weight of the MARC platform of about50 Kg, a rough computation of the required torque and power for each of the two motors controlling the vehicle motion has been performed, resulting in a desired torque of about 30 Nm and mechanical power on the driving-shaft of about 130 W.
Magnetic tracks have been selected as passive adherence system maximizing the contact area with the metal surface. In particular, in virtue of the exerted force, neodymium magnets are used. These magnets, also known as NdFeB, NIB, or Neo magnets, the most widely-used type of rare-earth magnets, are permanent magnets made from an alloy of neodymium, iron, and boron to form the Nd2Fe14B tetragonal crystalline structure. A couple of conical models have been initially identified on the market. The goal of the vehicle sensor package is to measure its position and attitude, and corresponding linear and angular velocities, as well as its interactions with the operating environment. It is worth noting that the operating conditions inside a ship hold make quite difficult, at least with the size, weight and price constraints given by a MARC-class platform, the measurement of basic variables such as linear position and heading. A high performance, miniature AHRS (attitude heading reference system) with GPS, combining MEMS sensor technology and a highly sensitive embedded GPS receiver has been selected for providing orientation, inertial, and, when possible, GPS measurements. The 3DM-GX3®-35 sensor incorporates a triaxial accelerometer, triaxial gyro, triaxial magnetometer, temperature sensors, and a dedicated 32 bit processor running a sophisticated fusion. The device, Fig.6, has the dimensions of44 mmx24 mmx14 mm- excluding mounting tabs, width across tabs37 mm, and a weight of23 g.
In order to perceive the operating environment, the MARC vehicle will be equipped with a couple of compact video cameras. The UI-1225LE camera, with modern Aptina CMOS sensor in Wide VGA resolution (752×480 pixels), allows a uniform architecture with the vision systems of other MINOAS platforms, e.g. flying robot. In order to acquire high precision and reliable range measurements between 0.1 m and 10.1 m, laser transit time sensors have been adopted. The sensor, powered at 24 V DC, provides very precise measurements, with 0.05 % of linearity inside the range 0.1 m to 5 m and 0.2 % between 5 m and 10.1 m, through both analog output, i.e. 0-10 V, and RS-232 serial port. In order to design and develop an embedded real-time platform based on commercial-off-the-shelf (COTS) hardware and free software, a Single Board Computer hardware architecture, characterized by PC-compatible CPUs, has been adopted. In particular, in order to optimize size and weight a computer board able to support all the I/O ports required by the navigation and control packages has been selected. The result is the adoption of the Nova9452 single board computer. A rough computation of the MARC power consumption, based on the adoption of a couple of Mac140 electrical motors, one CPU Nova9452, four laser range finders, two-four video cameras, and a small electro-mechanical arm, leads to an estimated need of 8.5 A @ 48 V. Rechargeable lithium-ion batteries offer very high energy density, excellent charge recovery after long storage, even at high temperature, and long cycle life. The design, development and assembly of the MARC autonomous robotic platform for ship inspection, in the framework of the MINOAS project, has been summarized, for a more extensive presentation of the system please refer to the paper presented in COMPIT 12 on April 2012.